Training therapy dogs includes poodles, who can train to be registered therapy dogs and visit hospitals, outpatient therapy centers or nursing homes for companionship or therapy. 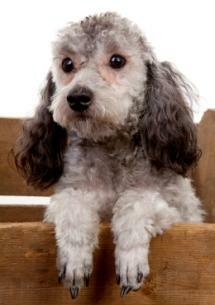 As a therapy dog, poodle's participate in the patient's inpatient or outpatient therapy. 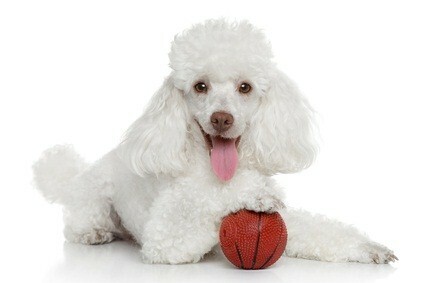 The patient can throw something - a ball - to help strengthen his arm, and your poodle can retrieve it. It's fun for your pet, he's helping people, and he's getting exercise, too! 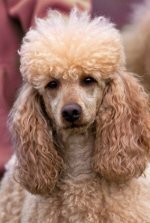 Therapy poodles can also help natural disaster victims and rescue workers by providing comfort and companionship to people or by doing tasks he is given. Schools use therapy dogs as reading dogs to help kids better their reading skills. The dog sits patiently beside the child while she reads to him. The child can read without fear of mispronouncing words and being laughed at or corrected as your pet sits beside her lovingly and patiently letting her read and sound out her words. Therapy Dogs International offers more information on getting your dog registered. Your dog has to pass a test before he's registered. Once he is registered he gets an ID tag, certification card, and information on visits to healthcare facilities. Keep his work suited to his personality. A pooch who's not fond of kids shouldn't be going into schools. And, make sure he's bathed and smells good, everyone will appreciate it! Poodles can be great therapy dogs as they learn quickly, can pick up on peoples' moods and love to be around people. Their intelligence is an asset as they can be trained fairly quickly. They want to please, and are always up for a challenge. Their patience and love can help kids with reading difficulties or hospital inpatients or outpatients heal with a loving companion by their sides.